Can Detective Paw see through the hijinks in this mysterious heist? Together, Detective Paw and Patrol Officer Prickles can crack any case. 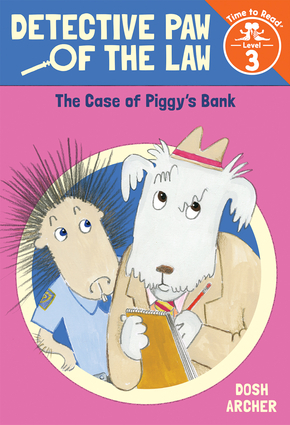 When they're called to Piggy's Bank, all the money has vanished! Who could have taken it? Solve the mystery alongside this delightful duo in this rollicking new series. Dosh Archer's madcap humor and love of strong, plot-based stories make her perfect for creating books for newly independent readers. She has written multiple books for children, including the Urgency Emergency! series and Looking After Little Ellie. Dosh lives in England.